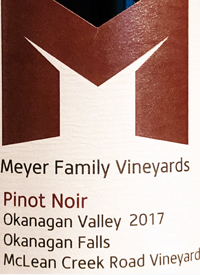 Okanagan Falls, Okanagan Valley, British Columbia, CanadaMeyer Family Vineyards makes several single vineyard wines from both pinot noir and chardonnay. This is the latest from the home estate in Okanagan Falls: McLean Creek Road Vineyard. The sparse, sloping, sandy alluvial/glacial gravels and sandy loams support five Pommard and Dijon clones (114, 115, 91, 667, 777) each farmed organically, plot by plot. Destemmed and native fermented with gentle hand plunging, this then went into French oak (25 percent new) for 11 months prior to bottling unfined and unfiltered. Expect a lusty dark raspberry, plush cherry, sarsaparilla flavoured pinot wrapped around a ripe core sprinkled with leather and spiced cedar on the way to a warm finish. You can drink this now, but it will reward another two four years cellaring.Tasted: 28 January 2019Tasted by: Treve Ring & Anthony GismondiPrices: BC	40.00	winery direct Producer: Meyer Family VineyardsDistributors: International Cellars Inc.